Allison was born and raised in a small town in Nebraska and loved animals as long as she can remember. Her parents taught her at a very young age to value and respect animals, both domesticated and wild. She considers this one of the most defining characteristics of her life. After high school, she came to South Carolina to visit family and loved it so much here that she decided to move south. Here in South Carolina is where she met her husband and father of her 2 daughters. Her family also includes 5 dogs, 1 cat, and 2 sugar gliders. When her children started school, she decided to continue her education. Since animals and their welfare has been a passion of hers her entire life, she decided to enter the Veterinary Technician program at Trident Technical College. Toward the end of the program, she became employed at Best Friends Animal Clinic where she has continued to learn and has thrived as a technician. She considers herself lucky to be surrounded by so many supportive people, both at home and at work. She loves having a job that she loves and believes in. She also appreciates the connection with clients and the opportunity to help their best friends have a long and healthy life! She recently passed her National Boards to become a licensed technician. It was no surprise to the staff at BFAC that she passed on her 1st attempt. 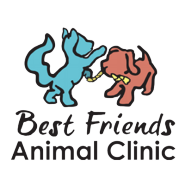 We offer our congratulations and are grateful that she has chosen BFAC to call a second home. Danarae grew up in southern Georgia next to her grandparents and uncle. Her love of animals began at an early age with horseback riding and volunteering at local shelters during her summers. She moved to South Carolina when her father retired from the military and has been here for ten years now. She graduated from Trident Technical College with her Associates in Veterinary Medicine in 2013. She passed the National Exam for Veterinary Technicians in 2015 and became licensed the same year. She currently resides in Goose Creek and spends her free time hiking and fishing with her dog Willow or cuddling on the couch with her older dog Lilly. She also has 3 cats who are content to keep themselves occupied most days. She was hired on at Best Friends her last year at tech school and has enjoyed every minute learning and growing at a clinic that can always provide new experiences.